Tues. Dec 13th -10am to 12 noon. Please pop in if you can find time away from business and Christmas shopping etc. We have included many local stories plus churches, community groups, D.H.L. Eastwood Writers, teachers etc in over 300 pages of text and pics. We wished to keep prices as low as poss. Selling them at cost + post and packaging. However, the books are printed by Amazon in the USA and we have to buy in dollars. Brian Fretwell, our researcher has managed to secure 100 books for the launch date. If you cannot get along could you please pass this message to any friends, family who might be interested in Eastwood, times past and present. So, what about this 2nd volume book, and why publish it at all? I was taken aback, he was quite right. So we had to write another book and literally dig deeper (excuse the pun). 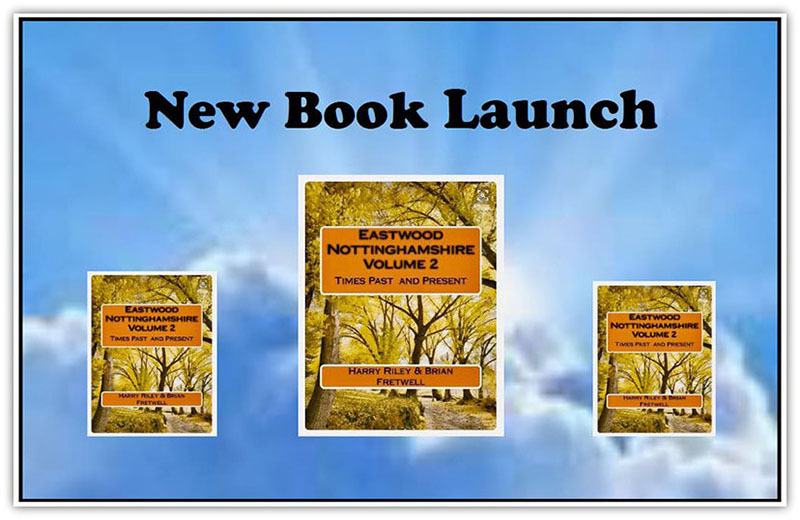 This 2nd volume is dedicated to Norman (Sol) Davis and we wish to give grateful thanks to the Eastwood people who have shared their stories with us. We believe the many family tales will amaze and astound you, from the ordinary men and women in the street, who are really extraordinary, and who have fascinating tales to tell of Eastwood and District, past and present. Included are anecdotes from all walks of life: doctors: dentists, sportsmen and women: teachers: local councillors: church leaders and historians: writers: poets and artists: shopkeepers: musicians, entertainers and health and community groups. 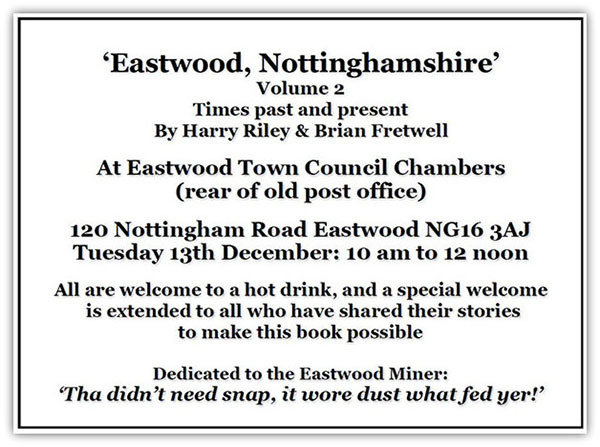 Brian, Joy and I spent much of 2016 working on this Eastwood digest and hope we have provided a small insight into such heart-warming stories of service and gratitude to our town…such as that of Maria, whose family were brutally shattered by the second world war. Lifelong Civic Service, way beyond the call of duty, by Mayors, and councillors: Don and Marjorie, Albert: Colin: Josie: Susan: Hazel and Lew, and June and Bill, to name but a few. Those inspirational teachers, historians, youth group guiders and church leaders, such as Nick and Bryan, Jean and Jack, Kathleen and Doreen, Doug and Horace, John and Ellie, Andy and young Beth. Literary figures: Willie and Les, and the great David Lawrence, and more recent authors: Helen, Deborah and Eve. 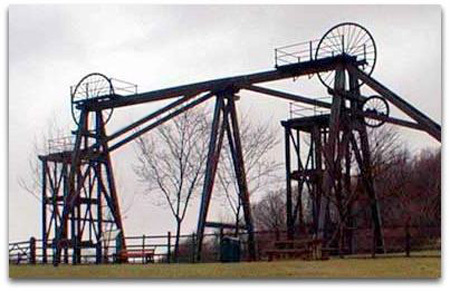 Sporting personalities such as Arthur and Bud and Jimmy and Ron, Chris and Ken and many, many more, all striving to make Eastwood Nottinghamshire, an even greater past and present.